Now showing at a garden near you (or perhaps in your own) the Golden Flowers of the Orient are bursting into bloom. Though best known for firing up fall with color, chrysanthemums are among the easiest perennials to grow in a garden-regardless of where that garden happens to be. Mums are happy in the dry heat of the Southwest or the humidity of either of the Washingtons, and many varieties can withstand winters in Minnesota or Maine. Mums are great impersonators, too. With nearly a dozen flower forms to choose from, you can grow mums that look like pastel daisies, or fluffy quilled zinnias, or refined dahlias, or maybe the large, fancy ones with incurving petals called "football" mums. The chrysanthemum palette includes every color but blue, and the holding time for blossoms, even in a vase, is measured in weeks rather than days. Merely keeping a pot on your porch is to miss a great growing opportunity, because mums are the perfect perennials to let into your beds. Gardeners have been enjoying mums for more than 2,000 years. By A.D. 400, these plants were the craze among Chinese gardeners. Today, most of the best kinds for North American gardens are known simply as garden mums, and are botanically classified as Dendranthea grandiflorum. This is a rather new name, and many catalogs still use the old name of Chrysanthemum morifolium. As you might expect with a flower that's been in cultivation for so long, the pedigree of garden mums is impossible to trace. Most of the plants sold in garden centers are labeled "cushion" mums -- a huge group of compact varieties bred to flower like gangbusters in pots, or to be massed into vivid border plantings. The Prophets Series from Yoder Brothers (the largest producer of chrysanthemums in the U.S.) is this type, as are hundreds of other named varieties. About 80 percent of the potted mums sold in the fall are Yoder Prophets, including 'Bravo' (red), 'Debonair' (dark lavender) and dozens of varieties with girls' names like 'Denise' (bronze), 'Jessica' (yellow), and 'Lynn' (pink). All of the most popular Prophets have the "decorative" flower form, that is, dahlialike blossoms so packed with long, broad petals that you can hardly see their center eyes, even when the flowers are completely open. One of the advantages of the decorative flower form is that the many layers of petals make the flowers last a long, long time. As the petals on the back of the blossom fade, new ones from the center give the flower a freshly opened appearance. But the best perennial mums for your garden may not be compact cushions with decorative flowers. Upright kinds, which grow more than 18 inches tall, are magnificent when grown in the ground, though their height makes them look gawky in pots. Alan Summers, owner of Carroll Gardens in Westminster, Maryland, thinks the best landscaping mums are upright types with flowers more than three inches across. He recommends a variety known as 'Single Apricot' (which is the same as or similar to 'Hillside Sheffield Pink'). He describes it as "absolutely spectacular, with luminous glowing color that can be seen a block away." Garden mums have so many dramatic variations in growth habit, color, and flower form that we would sell them short by suggesting that a few are better than all others. In San Gabriel, California, mum specialist Phillip Ishizu of Sunny Slope Gardens struggles to keep his list of West Coast standouts at only 300 varieties. In Burlington, Kansas, Harry Huff of Huff's Garden Mums propagates and sells 500 varieties, and Minnesota mum man Vincent Dooley offers more than 200 that can survive under serious cold and snow. All of these experts give the same advice for choosing favorites. Pick colors and flower forms you like, and get growing! Since fall brings frost, which has a bad habit of turning mum petals brown, choose mums with bloom times that match what your climate has to offer. 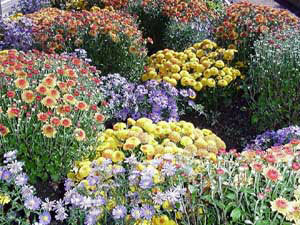 Mums bloom in fall because the shortening days (and lengthening nights) of late summer trigger flowering. Some react more quickly than others, and these are the early bloomers. Midseason and late bloomers respond more slowly to changes in day length. Throughout much of the U.S., gardeners can extend bloom season by combining early, midseason, and late-blooming varieties. However, early and midseason varieties are ideal for the country's midsection. Midseason and late mums put on the best shows in the Sun Belt, where early-blooming types are often fooled into a sparse, generally unattractive bloom in spring. If you're stuck with such a plant, pinch or cut off blooming stems to force the plant back into a vegetative state. Where freezes come early, you need early-blooming mums. And wherever you live, you'll be happiest with mums that bloom after the hottest summer weather has passed, yet still have five to six weeks to dazzle before the first 26°F frost, which kills flowers. Chrysanthemum hobbyists (and the following descriptions) use specific names to describe common flower types. They are: anemone (one or more rows of petals and a large, raised center); brush (rolled, pointed petals); decorative (long, wide, overlapping petals); incurve (large flowers with petals that curve upward and inward); irregular curve (like incurve, but less rigid); laciniated (petal tips fringed); pompom (uniform, globular flowers that can become 5 inches in diameter); quill (rolled petals long and narrow); reflex (big flowers with petals that curve various directions); semidouble (two or three rows of petals around center); single or daisy (a single row of petals); spider (long, tightly curled petals with hooked tips); and spoon (rolled petals that are flattened at tips). The best time to plant chrysanthemums is in the spring, though you also can plant them through summer and into early fall. The earlier you plant, the longer your mums will have to develop good root systems -- a crucial factor in determining winter hardiness. All chrysanthemums need full sun in the North, at least a half day of sun in the South, and always, everywhere, very well-drained soil. If you can save some space until spring, you can help yourself to the huge selections of garden-worthy varieties offered by specialist mail-order companies, which ship only in spring. Mail-order mums are single-stemmed rooted cuttings, which begin growing rapidly as soon as they are planted. To grow stocky, heavy-flowering plants, pinching back the growing tips is essential. Pinch off the top 1 to 2 inches of growth when taller varieties are 6 to 9 inches high and shorter varieties are 4 to 5 inches high. Repeat every three to five weeks until early July, more frequently with the most dwarf varieties. In warm climates, where mums begin growing in March, plants are usually ready for their first pinch by May 1. But in most of the country, pinch them the first time on Memorial Day, and the second time on the Fourth of July. If you have some lanky, unpinched plants to deal with right now, it's too late to make them short and stocky. But you can encourage them to make spectacular large and long-stemmed flowers. Stake them and pinch off most of the buds from the lowest section of stem. The blooms at the stem tips will be stronger and larger, and will make lovely long-stemmed cut flowers. As long as chrysanthemums have good drainage, they are not picky about soil. They often bloom without any fertilizer, but growth is better if you mulch them lightly in early summer with well-rotted manure or rich compost, or fertilize them lightly once a month with a balanced fertilizer (such as 10-10-10) until the flower buds form. Don't be surprised if mums that were compact when you bought them in pots a year ago grow much larger when set free to grow in your garden. They're just showing their appreciation for a long growing season on unrestricted roots. Climate plays a role in plant height, too. High temperatures slow stem growth in midsummer, but cool temperatures and heavy rain can make stems lanky. In mild, moist climates, many mums won't stay upright without support. To keep them from flopping, support them with thin bamboo or metal stakes before the flowers open. Alternatively, pinch growing tips more often to stimulate development of stockier, bushier plants. By the time garden mums have finished blooming, you may want to cut them back. Don't! In cold climates, the dead branches catch blowing leaves and snow, and often manage to collect just the right amount of protective mulch. In warm climates, even exhausted plants are engaged in the work of accumulating energy for next season's growth. Trimming off dead blossoms and wayward branches is fine, but as the mum experts say, "Nature doesn't trim back the dead branches in winter, and neither should you." Early winter is also the worst possible time to dig up mums, which often show a few feathery stems of new green growth near the base before winter. These delicate shoots are the plants' lifeline through winter. Chrysanthemums that put out a lot of new shoots often show excellent winter hardiness. When late-blooming mums are grown in warm climates, the appearance of a healthy fuzz of new growth halfway through winter means it's finally time to cut back last year's growth. Opinion varies on how often garden mums need to be dug and divided. Some say every spring, others say every second spring, and some say every three. Before you decide, consider this idea: You can flank your mums with large-flowered daffodils or fancy tulips, which provide much-needed spring color while chrysanthemums are at low ebb (and vice versa). These bulbs often require dividing or replacing after two or three years, just like mums. But there's a hitch. The best time to dig and replant spring-flowering bulbs is early fall, when mums are at their peak. So, at some point you must choose between keeping your mums or your bulbs, which is not difficult since mums multiply as willingly as rabbits. Remember those little green shoots that you nursed through winter-- Around the time of your last spring frost, simply dig and divide some of these, and transplant them to new homes or pots. Pots are ideal if you must wait until bulb foliage dies back to renovate your bed. Few plants develop roots as rapidly as chrysanthemums. After a few weeks in a pot, a skimpy little plant will become healthy and well-rooted, though in northern or short-season areas you won't get much of a plant or many blooms that first year. You can also root the stem tips you pinch from your plants in spring by sticking them in damp potting soil, sand, or vermiculite. Even with no help from rooting powder, stem cuttings will start rooting within a week. At this point I must insert a warning: Growing chrysanthemums can be habit-forming. Collecting and showing them is addictive. Whether you want to compete or simply collect mums, the National Chrysanthemum Society has 35 chapters across the country. Membership costs $20 per year, and the society also publishes inexpensive pamphlets on the finer points of mum culture. For more information, visit the Society's Web site at www.mums.org. 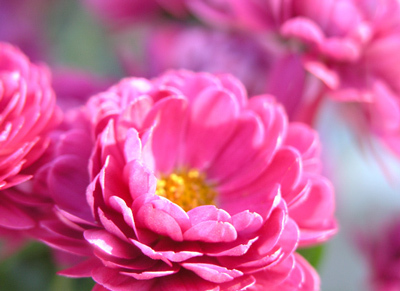 Spring is the best time to plant chrysanthemums, but you can set out blooming plants in fall if you're careful. Here's how to help them survive their first winter in the ground. 1. Select bushy, well-branched plants with small, leafy stems emerging from the base of the plants, or sprouting around the edge of the pot. 2. Choose a very well-drained location. More fall-planted mums die from root rot than from the effects of low temperatures. 3. Dig a planting hole twice as wide as the plant's rootball. 4. Set each plant in the planting hole 1 inch deeper than it grew in its nursery pot; spread out the roots. 5. After cold weather kills the flowers and leaves, water only if the soil becomes very dry. Trim back tops very slightly, mostly to remove dead blossoms. 6. Leave plants unmulched until Christmas. If by then, you have no snow cover, lay conifer boughs over the plants' crowns. 7. Should you decide to move your mum, wait until near the time of your last spring frost. That's the best time to dig and divide any garden chrysanthemum. 8. When growth resumes in spring (or just after transplanting), work 1/4 cup of low-nitrogen fertilizer (such as a 10-10-10) into the soil around each plant. Even though there are hundreds of good varieties of chrysanthemums available, the advice of experts in various regions resulted in this short list of the most outstanding or noteworthy. The list is divided into two categories based upon plant height. The short ones, often called "cushion" mums, grow 12 to 15 inches tall. The tallest mums reach some 30 inches tall.